While they prepare for Passover, a family of Jewish women klezmer musicians struggles for survival, but music and love prove not enough, only the unthinkable can save them. Also features The Devil's Brides, music inspired by the audio play. I stumbled across The Witches of Lublin when I was browsing what had been nominated for the Audie Awards - saw that it had been co-written by Ellen Kushner (of Swordspoint fame) and featured Neil Gaiman as one of the actors. It was co-written by musicians Elizabeth Schwartz and Yale Strom. It's beautiful and haunting - a heartbreaker of audio drama. It's kind of pricey compared to other audio books and programs of much greater length available at Audible, but I've now listened to it twice, and it's worth every cent. It's Poland, 1797, a difficult time and place for Jewish people, which makes it all the more dangerous for a small group of Jewish women doubling as "klezmer" musicians. Rivke is the daughter of a supposed Jewish mystic (the table used to rise when they sang together as a family), and she leads a band of her two unmarried daughters, and orphaned granddaughter. Women playing music in a crowd mixed with men is forbidden, but Rivke and her family need the money it brings in for the coming Passover. It doesn't take long for word of their incredible music to spread, which makes things uncomfortable for the struggling women, and leads the story to it's captivating, haunting climax. The audio drama is just under an hour's length. It's jam packed with amazing music (courtesy of Yale Strom) and sound effects - but all of that goes toward enhancing the story, not detracting from it. This is in no small part to the performances - particularly Tovah Feldshuh as Rivke. I've already started searching for books she's read, her voice was so mesmerizing. The rest of the cast does a great job supporting Feldshuh. As Sofia, Elizabeth Boskey's stunning voice captures innocence, idealism, and naivete. Simon Jones gives real menace and privilege to Graf Sobiesky. Finally, Gaiman, who for many geeks is our icon of depth and charm, brings a certain weight to Bogdan's role as the count's uncommon son. 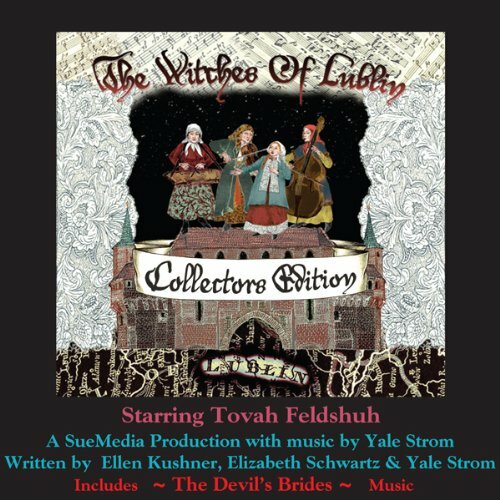 The second hour is made up by Yale Strom's fantastic music (and brief asides/introductions about how the music fits into Jewish culture, as well as the drama itself) which his wife Elizabeth Schwartz sings on. It's gorgeous music, and as a result, I've now seen Strom and Schwartz play live. This is a first-rate production about culture and women, music and storytelling, magic and spirituality, the love between a family, and the love between two young people. It's not terribly long, but it's very much worth a couple hours of your time.